Climbing plants are a great way to add a vertical design element to your landscape. They can be used on a trellis, fence, lamp post, or any other vertical support. Some of them such as Ivy or Virginia Creeper will also double as a ground cover. I remember as a child, one of the neighbors had a white lattice arbor that had climbing rose plants growing on it. The contrast of the white arbor with the dark green foliage and deep red flowers formed a lasting impression in my mind that I can still see 50 years later. 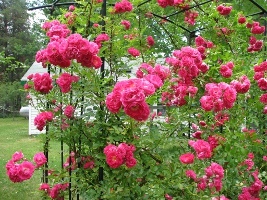 Add the fragrance of the Roses and you have a wonderful addition to your garden. When we moved into our home there was a utility pole between our neighbor’s house and ours that had trumpet vines growing so thickly around it that we didn’t even notice that it was a pole. The deep green fern-like leaves and the deep red-orange flowers from this plant delight every year, with absolutely no help from us. The Cardinals like to nest in the tangle of vines and the Hummingbirds visit the flowers frequently. The perennial plants are generally low-maintenance and can be used to cover fences or walls. They have a sound-deadening effect that will add to the solitude of your garden. Used as a ground cover, plants such as English Ivy can quickly cover shady areas that are usually difficult growing areas such as under trees and they are evergreen as well. Trellises, pergolas, and arbors were made to be covered with climbing plants such as grapes, roses, or wisteria.